Grant Baldwin The Occupy Charlotte campsite at old City Hall on East Trade Street at dusk on Nov. 26, 2011. On Oct. 8, 2012, about 12 Occupy Charlotte members filtered in and out of the area in front of the old City Hall building, where they had lived for four months over the previous winter. They were there to celebrate the group's first birthday, but it quickly became clear that the fire that had sustained them throughout the cold months of 2011 wasn't burning as fiercely. Four members stood to the side of the crowd listening to someone speak. One of them told another, "We could just go over to my house and get drunk soon." Standing a few feet away was Occupier Ron "The Professor" Meade, who said he was disappointed in what he felt was Occupy Charlotte's small turnout during DNC protests. He spoke of the movement as if it had failed. "I thought people would pull together more. They didn't pull together like I thought they would. I guess it wasn't rough enough. I guess it has to get a lot worse." In the year since that meeting, the last Occupy Charlotte gathering officially held, members speak of Occupy in more forgiving terms than Meade. A few have even used the momentum created in those late 2011 months to engage in other forms of activism. Michael Zytkow, a leader in the "leaderless movement," recently became the first independent to ever get on Charlotte's City Council ballot. Laurel Green, another of the more outspoken members, has been active in Moral Monday protests around the state. Though Zytkow admits the group as it was has died, there is evidence that suggests Occupy Charlotte might not have killed itself. Despite the chilly fall evening and the group's waning enthusiasm, Scottie Wingfield seemed to bounce around the lawn of old City Hall — which Occupiers deemed "The People's Lawn" — trying to pitch a tent, one of the few left after most had been confiscated by Charlotte-Mecklenburg Police before the DNC arrived. What many in the group didn't know was that Wingfield was in the midst of a struggle with bipolar disorder and fighting a bout of depression that would soon keep her cooped up inside her home and completely inactive in the protest community for months on end. She recently referred to that night on the lawn as her "last hoorah." Speaking over the phone from California, where she recently moved with her fiance, Wingfield says she still thinks about why the group disbanded. "Going in, you expect the cold weather and the challenges from the city. What's really sticking with me is seeing the intended disruption from the outside. There were instances of obvious infiltration." Wingfield and Zytkow believe CMPD sent undercover officers inside Occupy Charlotte with the sole purpose of disrupting meetings. "There were people I became close with and took hours-long, cramped car trips with," Zytkow says. "They became friends and then as soon as the DNC ended they didn't exist anymore. Their phone numbers, their Facebook accounts were gone." Zytkow says if a disagreement would arise over whether Occupy Charlotte should join with another group's protest, these participants would usually spur on the arguments. He says he believes they turned against Wingfield the most, either because of her struggles with mental disorder or because she was a leader. Some undercover police were more obvious than others. Zytkow laughs when he recalls the benches at bus stops near Occupy marches filled with "white guys always wearing either tie-dye or band reunion shirts." 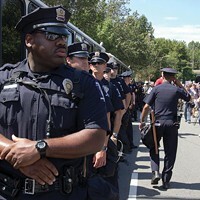 CMPD Captain Jeff Estes admits to using plain-clothes police "all the time" at the Occupy camps and protests. He says, however, that he is not aware of any infiltration into the group's meetings. Estes suggested that former CMPD Deputy Chief Harold Medlock would be more informed of any undercover activities. Medlock, now the Fayetteville Police Department's chief of police, did not return calls for this story. Requests to CMPD attorneys for information regarding surveillance from undercover officers were turned down. Zytkow is awaiting the results of several requests he's submitted to CMPD for more information on its surveillance techniques used during the DNC. Beyond police disruption, obstacles more inherent to Occupy's philosophy contributed to members going their separate ways. The horizontal leadership idea embraced by Occupiers throughout the U.S. dictated that everyone had a say in how protests and strategies were conducted. The movement was, essentially, leaderless. But because it was filled with a broad spectrum of people representing different causes, from environmental activists to anarchists, coming to a consensus or furthering a position was often difficult. "The part of Occupy that was exciting and experimental was the consensus. But that was the really hard part," says Green, the former Occupier now heavily involved with Moral Monday. "We knew we were taking the hard road, but it was an important part of our process to be open to everyone's contributions." Zytkow agrees that the all-inclusive road was a tough but necessary one to take, in order to stay true to the Occupy philosophy. "Unless we learn to do that, the world's not going to thrive," he says. "It's extremely difficult; you have to push your ego aside. But if we want society to work this way, then we have to start from the ground up." 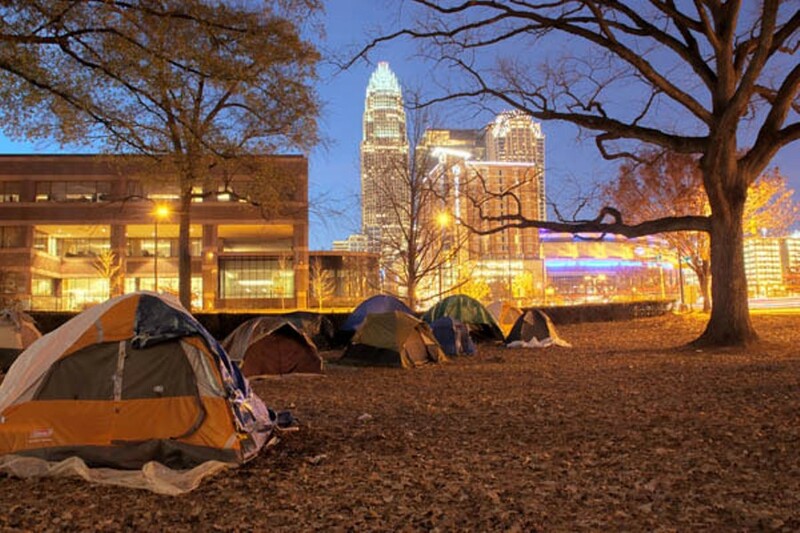 Many see Occupy Charlotte as a trunk, from which strong branches sprouted. "We saw this all along, that it wasn't going to continue in this way," says Zytkow, sitting on some steps outside a courthouse after a rally this August marking the 50th anniversary of Martin Luther King Jr.'s "I Have a Dream" speech. "We felt it transforming. We had learned so much and we wanted to take those new-found skills and allies and use them in other areas ... and it worked. How could you say we've died when the whole justice movement is stronger?" Occupy Charlotte not only cultivated local activists who have moved on to work with organizations such as Action NC and Greenpeace, it also birthed Charlotte Environmental Action. 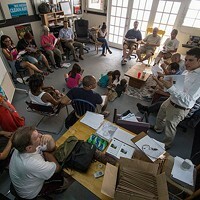 The group holds weekly meetings and recently staged its first protest. Eleven of the 25 active members held a "die-in" in front of Duke Energy's headquarters on Aug. 21, where they sprawled on the sidewalk as if dead to protest the coal ash left behind by Duke's coal-burning plants. Some members still hold out that Occupy Charlotte will return. "I dream of those days all the time and still hope for an event that will make people take to the streets in masses," says Ayende Alcala, a member since the first meeting in Marshall Park, in October 2011. "Occupy will always be alive; we still occupy the conversation." While most in the group speak fondly of Captain Estes and the CMPD officers they met during Occupy's year of activity, many still feel let down by local government officials for pushing them out of the public eye. In January 2012, City Council approved a new city ordinance barring camping on the old city hall's grounds. That decision was made around the time Wingfield's depression became debilitating. She hopes her change of scenery will awaken her activist spirit, but she has noticed that Occupy groups in her area have been inactive on Facebook for almost a year. She has not forgotten her time in Charlotte, however, and, like Zytkow, is seeking information from CMPD about the role undercover officers played in infiltrating the Occupy Charlotte movement. "I hope to see Occupy's spirit in full expression again soon," Wingfield recently wrote in an email. "And I hope that in my lifetime we will hold the powers that be accountable for trying to kill this spirit."